Your therapist will tell you that we’re all susceptible to a post-holiday slump this time of year. Which makes sense. Attempting to believe that life isn’t a tragic, repetitive loop of mostly warmed-over versions of days you remember being better the first time you enjoyed them can be difficult, especially when it’s cold and gray outside. And your vacation is over. In some seasons the climate is softer and our lives more manageable. It’s not as hard to get up in the morning, our knees don’t ache, and the coffee is good. We can make it, just maybe more slowly than we once did. Other seasons are, well, this past year. And no matter what moral stand we’ve taken in that great string of Internet arguments we all use to construct who we are, 2016 was a terrific year for nihilism and defeat. Despite our own and Rev. King’s best efforts, the moral arc of the universe seems only to bend in on itself and collapse in the wake of a seemingly endless stream of bad news and societal self-immolation. But then, just when winter is darkest and the light barely warms enough of the day to melt the frost on my windshield, I’m invited to remember that God entered the world in the arms of an unwed young woman and her confused fiancé after a long journey to a backwater village on the underside of imperial power, religiously sanctioned violence, and historic unrest. It’s almost time for Epiphany. And the holy family isn’t whispering to us that at some point this unchanging, exhausting trudge through existence will mercifully end, so get over it and get on with it. No, the holy family, as I came to discover during the birth of my own son, is a violent interruption of all the ways our life has progressed up until now. When my son entered the world, he fundamentally changed it for so many people he had never met. In his first breaths and cries, he brought a stinging clarity to the ways the gaping and incurable hole left behind by my own father could only be filled by giving my son what I had always wanted, but never had. There’s a kind of quiet resolve (peace, if you want) that comes from meeting yourself as a child. It’s a chance to start again, even though you’re incredibly cynical and your back hurts, not in order to leverage the life of your child to satisfy the lack you’ve grown accustomed to living with. This is what therapists call “destructive entitlement.” I would argue it’s what is gripping our globe as each generation takes from the next what it never received from the one before it. Destructive entitlement is why you spent your childhood taking care of your mom rather than your mom taking care of you. Destructive entitlement is why you’ve called the admissions office of your son’s preferred college 4 times this week because deferred admission is unacceptable for this family. But what a baby brings is the fundamental invitation to give radical love, trust, grace, peace, hope, joy, justice, and belonging that you never got to the tiny being in your arms—and this is the important part—WITHOUT EXPECTATION THAT THE BEING WILL PAY YOU BACK FOR YOUR EFFORTS. Because if he or she does (even if you named him Jesus), you’ve missed the point in all this. On a 30,000 foot level, the Holy Family invites us to parent the world in all the ways we wanted the world to parent us. Their witness is an invitation to enter into broken community, corporate, and family systems with a renewed resolve that only new life can bring, in order to swallow the hole inside of us by filling it with our gifts of love and trust freely given to others. And this is the important part: WITHOUT EXPECTATION THAT THE SYSTEM, THE WORLD, OR EVEN GOD, WILL PAY YOU BACK FOR YOUR EFFORTS. 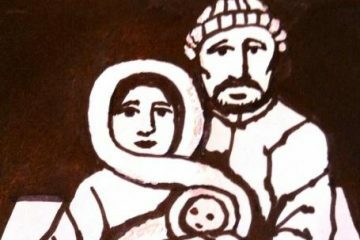 The peace of the Holy Family isn’t trite, isn’t nostalgic, and isn’t futuristic. It’s sleep-starved, and scared, and thrilled, and full of inexplicable, spit-stained hope. In my experience: new parents limp, but they also beam. May you beam in the dark during this season of light because a baby has entered your world.